Additional Info: Fabulous Prestige with new decking for 2019, Pet Friendly Caravan. With hairdryer and ironing board in master bedroom. Acceptance of pets shall be at the owners discretion. A 25% non-refundable deposit secures your booking. The balance must be paid 4 weeks prior to your arrival date. If you book inside the 4 weeks, payment must be made in full at the time of booking. Payment can be made by Debit, Credit Card, Bank Transfer, PayPal or Cheque via our secure payment portal. An electronic receipt will be provided. Check-in and key collection is from a key safe on the day of your arrival. Full arrival details will be provided. Our fabulous position within the site provides access to site amenities within a few minutes yet retains a sense of quiet. Ocean views are also just a few minutes walk away. 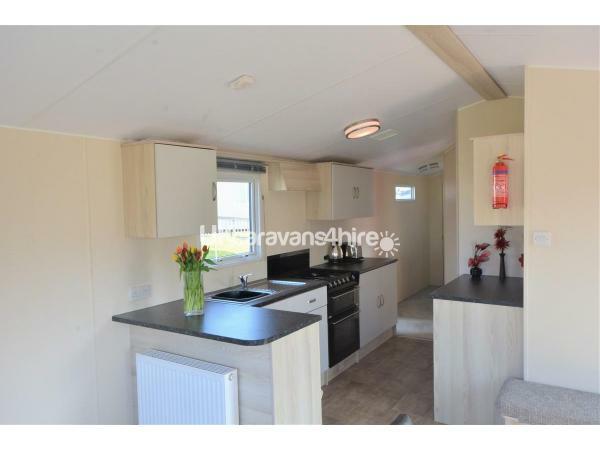 Graded as 'Prestige' and pet friendly & with Decking too, this caravan has a host of high quality features giving it an air of affordable luxury. With central heating throughout and fully double glazed windows you are ensured to be both warm and cosy regardless of the time of year. Stepping into the caravan, the lounge and dining room are to your left. This bright spacious, open plan area has a real modern feel, with a large L-shaped seating unit, with the near section making up part of the seating for the dining unit. There's a sturdy free standing dining table and additional stools opposite. The seating unit also incorporates a pull out double sofa bed. Opposite, a stylish wall unit contains the 32" TV/DVD with Free view. The wall mounted electric fire completes the modern contemporary look. This is open plan and galley style, with a central walkway. It really is a great workable space with small breakfast bar, full sized oven/grill and a 4-burner hob. There's a fridge with freezer section, microwave, kettle and toaster. Indeed it's equipped with everything you should need for your stay - we even provide your tea towels. An angled door reveals the bright and airy master double bedroom, featuring a comfortable 4'6" double bed, complete with duvet, pillows.There's bedside shelves, double wardrobe with mirror. We provide an iron, ironing board and hairdryer, meaning less to pack. 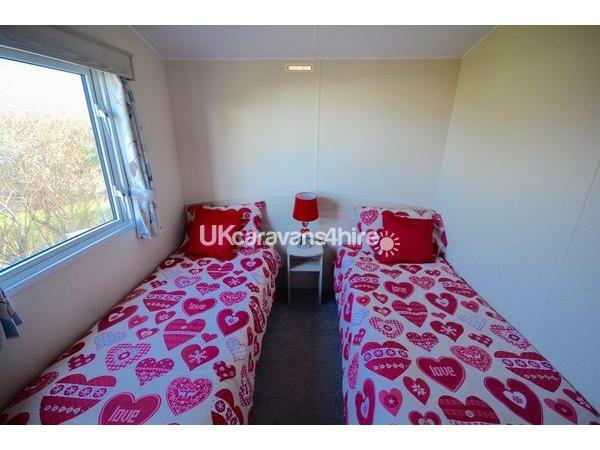 Located at the rear of the caravan, this twin room is a much larger space than you might expect. With twin beds and a central bedside shelf, there's plenty of space to walk between the beds. A built in wardrobe also provides additional storage. Again complete with duvets, pillows and all bed linen. The family bathroom contains large shower unit, extractor fan, hand basin with mirror above and WC. 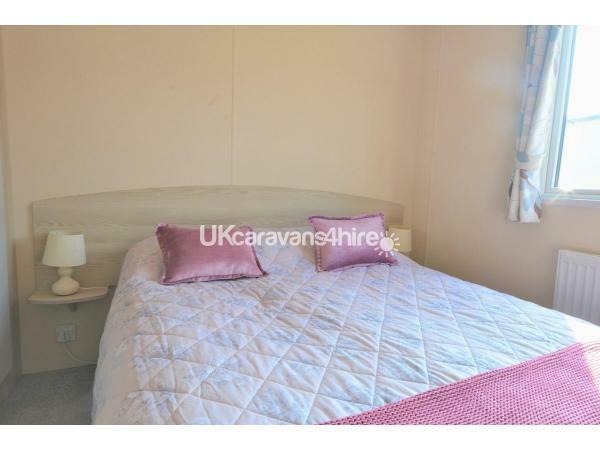 In the rear corner of the caravan is a separate WC and hand basin conveniently located for either bedroom. There is parking for your vehicle and direct access onto the dunes. Additional Info: For access to the swimming pools, clubs, leisure and entertainment facilities on the site you will need to obtain Fun-works passes. These can be purchased from Haven on your arrival day from reception (prices vary throughout the year and are not included in the rental price).